Walk, Jog, Bike, Carpool, Drive, Cab, Pedicab, Motorcycle, to Schwartz Living Market: An Urban Oasis for Healthful Living! Free parking behind the market across Bingham Street! Schwartz Living Market is open Tuesdays through Saturdays from 11:00 AM to 5:00 PM. We are An Urban Oasis for Healthful Living! An amazing juice bar, and vegan, gluten free food are our signature offerings at this moment in time. Even more options are available on Saturdays. If you are on the path to healthful living and wellness, stop on by, and be part of the action! Free parking behind the market across Bingham Street for customers. Our anchor tenants Tuesday, Wednesday, Thursday and Friday, are Jonathan's Foods, and The Enchanted Garden Juice Bar. In addition to these two amazing vendors, other vendors on Saturdays include Soup For Your Soul, Designs by Gloria & Company, the Educational Vision Gym, Third Day Soaps & Garden, Yellow Corn Native American Recovery, Photography by Richard Snyder and Photography and more by Laura Beck. Select books for sale include Bioshelter Market Garden: A Permaculture Farm by Permaculturist extraordinaire and our designer and contractor, Darrell Frey; Wisdom From An Empty Mind by Jacob Liberman with Erik Liberman; Healthful Cuisine by Anna Marie Clement, LifeForce: superior health and longevity; Living Foods for Optimum Health: Your Complete Guide to the Healing Power of Raw Foods & Killer Clothes by Brian Clement co-director of the Hippocrates Health Institute. Dr. Jacob Liberman and Dr. Elisa Haransky-Beck will be hosting an experiential workshop, Stop Looking, Start Seeing, on Sunday, May 4, 2014, from 10:00 AM to 6:00 PM. Recommended reading prior to this event is Jacob Liberman's book, Wisdom From An Empty Mind, available for purchase at the market. Go to http://www.brownpapertickets.com/event/621399 to register for this amazing event. Vegan, gluten free lunch and fresh juice included in the registration fee. Direct questions to Dr. Haransky-Beck at schwartzlivingmarket@gmail.com, the Schwartz Living Market Facebook page, or to #412-491-0303. From Kirstie: I will be holding an experiential workshop that will serve as my graduate research project. My list of interests is so multidisciplinary that I decided a phenomenological study would best suit inquiry on consciousness. I would like to someday create and teach art therapy workshops like this to assist in spiritual identity discovery and development. *Currently I am submitting to the IRB and awaiting approval from my advisors and the board at Saybrook,.. but I would like to get a group of potential volunteers beforehand to get the word out. The first Friday of April, 2014, I will be leading a workshop/study at Schwartz Living Market, where participants will be in 1 of two groups: drummers or painters. We will have multiple twenty-minute drumming sessions in which the artists interpret the music into a small painting. Directly proceeding the study there will be some time to socialize and eat delicious creations from Jonathan's Foods and The Enchanted Garden juice and smoothie bar! Research is always voluntary. Please invite others and share, I would ideally like to have 20-30 participants. *There is free parking behind the building. *You may keep each painting that you create during the workshop, however it will be held immediately after the event for analysis. *All art supplies will be provided as well as FREE vegan/vegetarian/gFree foods after. *PLEASE ARRIVE BY 4:45 AT THE LATEST AS THE STUDY BEGINS AND THE DOORS WILL BE LOCKED AT 5PM! Saturday, March 22, 2014, 10:00 AM to 1:00 PM: Tasso Spanos, C.M.P.T. on Low Back Pain Relief. Join Us! Join us on Saturday, March 22, 2014 from 10:00 AM to 1:00 PM at Schwartz Living Market! Cost for this amazing workshop is only $30.00 in advance or $35.00/person at the door!!! This is a myofascial trigger point course offered as an alternative to surgical intervention, drugs or aggressive therapy. There are 9 different muscles that can contribute to various locations of pain in the lower back and sciatica pain. The focus will be on traumatized spots in the muscles called trigger points, which refer to pain or weakness to other parts of the body, thereby confusing clinicians who are not aware of their existence or complexity. Participants will be taught where the trigger points are located and how to treat and stretch them. Handouts will be provided. Tasso Spanos has 32 years of experience as a pain specialist. He earned his B.S, in Biology from Bucknell University and did his master's work at the University of North Carolina. He is a member of the American Academy of Pain Management, the American Society of Pain Educators, and the National Association of Myofascial Trigger Point Therapists. He has studied with Dr. Hans Kraus, Bonnie Prudden, Dr. David Simonds, and Dr. Janet Travell, White House Physician to President Kennedy. His many presentations include the American Academy of Pain Management, Cleveland Clinic, and many groups of MD's, DD's, RB's, PT's, OT's and massage therapists. Mr. Spanos is the founder of the Pittsburgh School of Pain Management and was the director of the Center for Pain Treatment. He created the Feeling Better exercise video, contributed to the book, Clinical Mastery in the Treatment of Myofascial Pain, and has presented frequently to the Pittsburgh Live Today show on SBSTV-KDKA Pittsburgh. He has led his stretch class, Feeling Better, since 1982 at Chataqua Institute and at St. Stephans Church in Sewickley, PA, Osher classes at Carnegie Mellon University, and Grass Roots Festival of Music and Dance. Register by calling Tasso Spanos at 412-977-1896, or calling Elisa Beck at 412-491-0303, or E- mailing SchwartzLivingMarket@gmail.com, or contacting us through the Schwartz Living Market Facebook page. Mail check or money order to Schwartz Living Market, P.O. Box 81081, Pittsburgh, PA, by Thursday, March 20, 2014, or pay at the door by cash, check, or credit card. Pre-registration is preferred! Cost is $30.00/person in advance or $35.00/person at the door. We look forward to seeing you on March 22! Following Tasso's workshop, there will be a free GMO free, organic seed sharing facilitated by Ashley Paradox. Please note Schwartz Living Market is closed this coming Saturday, March 15, 2014. Happy St. Patrick's Day! We are in the process of planning next year's Schwartz Living Market's St. Patrick's Day strategy along with folks from the Green Building Alliance, PA Resources Council, and more!! We are planning a truly clean GREEN St. Patrick's Day celebration in Pittsburgh's Historic South Side for 2015! Special Saturdays in March, 2014 at Schwartz Living Market! 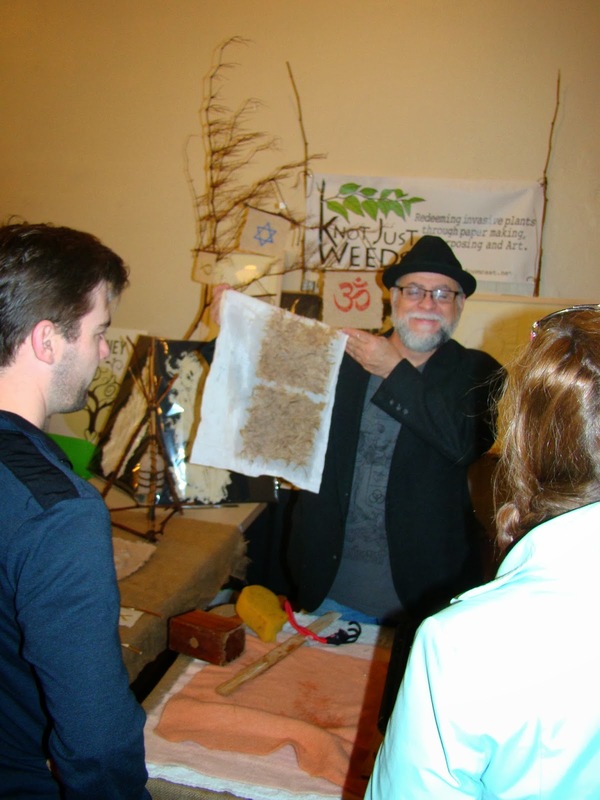 Albert of Knot Just Weeds demonstrating Paper Making at Schwartz Living Market! Who are the politicians in the bunch? Barbara of the Lion's Club and our famous Bruce Kraus, now President of Pittsburgh City Council. We love you Bruce! Schwartz Living Market during the South Side Soup Contest on February 22, 2014! Schwartz Living Market's hours are now Tuesdays through Saturdays 11:00 AM to 5:00 PM; Anchor vendors on Tuesdays through Fridays are The Enchanted Garden Juice Bar and Jonathan's Vegan/Gluten Free Foods! Dr. Elisa Beck hosts an educational Vision Gym on Thursday afternoons anytime between 2:00 PM to 4:00 PM. In addition to Jonathan's Foods and The Enchanted Garden Juice Bar on Saturdays Soup For Your Soul, Third Day Organics, Gloria Pierson of Designs by Gloria, and David Smith of Yellow Corn Native American Recovery join us! Saturday, March 22, 2014: Seed Swap facilitated by Ashley Paradox! Register through schwartzlivingmarket@gmail.com or by calling Tasso at 412-431-5939. Sunday, May 4, 2014: for an experiential workshop with Dr. Jacob Liberman and Dr. Elisa Beck: Stop Looking, Start Seeing; $200 by April 15, $225 by May 1 and $250 at the door. Questions and Registration through schwartzlivingmarket@gmail.com and 412-491-0303. September, 2014: During the last weekend in September, Schwartz Living Market will host a three day Advanced Permaculture Design Workshop. Details soon! Vendor spaces are available for rent. Contact us at schwartzlivingmarket@gmail.com or 412-491-0303.